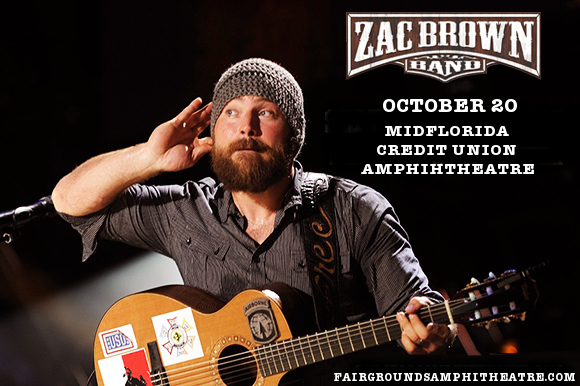 Are you ready for the Zac Brown Band?? Country’s favourite group returns to the MidFlorida Credit Union Amphitheatre as part of their massive The Owl North American tour on Sunday 20th October 2019, with special guests to be announced yet!! If you didn’t manage to catch them live last year, now’s your chance – but those tickets will go like hot cakes, so get your hands on them quick, before someone else does! Led by Zac Brown, the Zac Brown Band features a line-up including Coy Bowles, Clay Cook, Daniel de los Reyes, Matt Mangano, Jimmy De Martini, Chris Fryar, and John Driskell Hopkins. With a series of hits since the band’s formation in 2002, the Zac Brown Band have become one of the best-loved groups in country. Fans will be familiar with their biggest and best-known song, “Chicken Fried,” in addition to a whole bunch of other hits including “Toes,” “Colder Weather,” “Knee Deep,” and “Goodbye in Her Eyes”. The band’s latest album, “Welcome Home,” was received with delight by audiences and critics alike, carting in the top 5 of the Billboard 200 with AllMusic writing; “The sound of Welcome Home is a warm, comfortable bath. Brown still has a way with a honeyed melody and his band is just as supple, meaning this album is the very definition of music as comfort food." Listen to their latest awesome single, “Someone I Used To Know,” below – but don’t wait about too long, those tickets will be gone before you know it! !